The dam has truly broken. 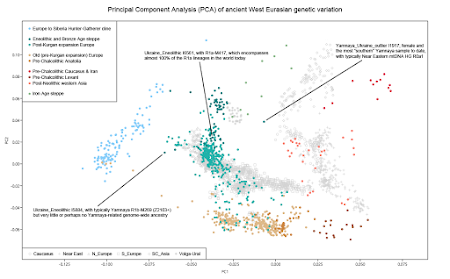 Below is my usual Principal Component Analysis (PCA) of ancient West Eurasian genetic variation, except now also featuring the new samples from Mathieson et al. 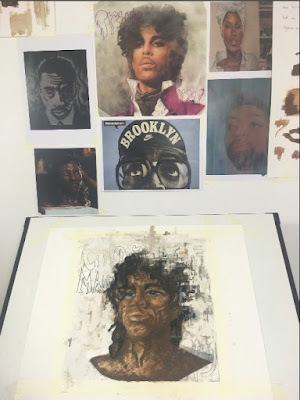 2018 and Olalde et al. 2018. Incredibly, there are almost a thousand ancient individuals on this plot. The relevant datasheet is available here. 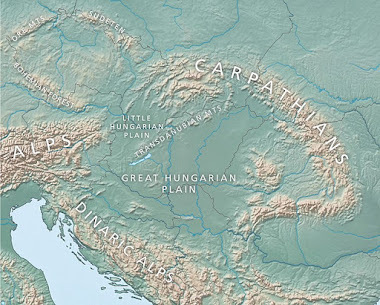 My imagination is probably running wild from all of this excitement, and I apologize if it is, but I reckon that the "Post-Kurgan expansion Europe" cluster actually looks like it's beginning to swarm all over "Old Europe", much like a swarm of locusts. These are, of course, our Bronze Age ancestors, rich in steppe ancestry and Y-haplogroups R1a and R1b. I reserve judgment on whether that's a good or bad thing. In any case, note that I highlighted three samples in this analysis. The reason I did this is because I believe that at least two of them might be crucial to understating the Proto-Indo-European (PIE) expansion. I've given hints as to why on the plot. Am I on the right track? Feel free to let me know in the comments below. A new preprint has just appeared at bioRxiv on the Mesolithic to Neolithic transition and resulting massive population shift in Britain. It features genome-wide data from six Mesolithic and 67 Neolithic individuals, including the famous Cheddar Man. Population Replacement in Early Neolithic Britain by Brace et al. The peculiar thing about this preprint is that it doesn't list the Y-haplogroups of the male ancients. However, it's been rumored for a while that Cheddar Man belongs to Y-haplogroup C (for instance, see here). Has this now been confirmed officially anywhere? On a related note, the guys at DNAGeeks have been working on a range of Cheddar Man products (see here). So for a few bucks you can get yourself a Cheddar Man tee or wall print based on this arty depiction of the Mesolithic British forager. Yes, his resemblance to pop icon Prince is indeed uncanny. The Global 25 is a more powerful version of the Global 10 ancestry analysis (see here). If all goes well in the comments, it'll soon be offered for free to those who already have Global 10 coordinates. After that, we'll see what happens. Below is a quick attempt to model Samara Yamnaya with its Global 25 coordinates using nMonte2. Hmmm...interesting stuff. Obviously, this makes a lot of sense, but it's somewhat different from my recent models of Samara Yamnaya using methods based on formal stats (see here and here). In the end, only ancient DNA from the steppes and Caucasian-Caspian region will settle this issue when enough of it is sampled. Update 10/02/201: As per our discussion in the comments, in most cases it might be useful to restore the variance of the raw data (like in the datasheets here and here). This can be done with the EigenScale.R script available here. You'll also need a text file of the relevant eigenvalues, available here. Instructions on how to call the R script are here. Below is the same model of Samara Yamnaya as above, except using the "restored" data. The result is very similar, albeit a little cleaner. Abstract: Despite the increase in our knowledge about the factors that shaped the genetic structure of the human population in Europe, the demographic processes that occurred during and after the Early Bronze Age (EBA) in Central-East Europe remain unclear. To fill the gap, we isolated and sequenced DNAs of 60 individuals from Kowalewko, a bi-ritual cemetery of the Iron Age (IA) Wielbark culture, located between the Oder and Vistula rivers (Kow-OVIA population). The collected data revealed high genetic diversity of Kow-OVIA, suggesting that it was not a small isolated population. Analyses of mtDNA haplogroup frequencies and genetic distances performed for Kow-OVIA and other ancient European populations showed that Kow-OVIA was most closely linked to the Jutland Iron Age (JIA) population. However, the relationship of both populations to the preceding Late Neolithic (LN) and EBA populations were different. We found that this phenomenon is most likely the consequence of the distinct genetic history observed for Kow-OVIA women and men. Females were related to the Early-Middle Neolithic farmers, whereas males were related to JIA and LN Bell Beakers. In general, our findings disclose the mechanisms that could underlie the formation of the local genetic substructures in the South Baltic region during the IA. 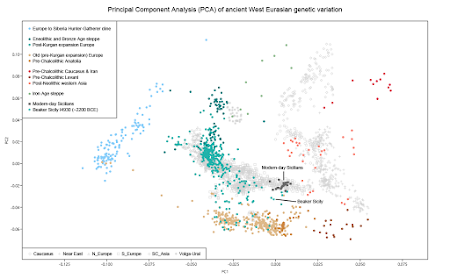 Computing D-statistics for each individual of the form D(Baltic LN, Yamnaya; X, Mbuti), we find that the two individuals from the early phase of the LN (Plinkaigalis242 and Gyvakarai1, dating to ca. 3200–2600 calBCE) form a clade with Yamnaya (Supplementary Table 7), consistent with the absence of the farmer-associated component in ADMIXTURE (Fig. 2b). Younger individuals share more alleles with Anatolian and European farmers (Supplementary Table 7) as also observed in contemporaneous Central European CWC individuals . We can add a third early Baltic Corded Ware sample, Latvia_LN1, to this list, because this individual was also shown to lack the above mentioned farmer-associated component in ADMIXTURE by Jones et al. 2017. 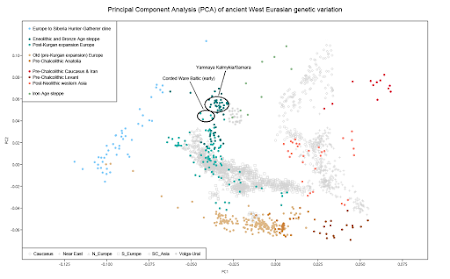 However, in my Principal Component Analysis (PCA) of ancient West Eurasia, all three samples fall just "northwest" of Yamnaya, along with one German Corded Ware outlier, and form a separate cluster that is shifted slightly closer to European hunter-gatherers and farmers. 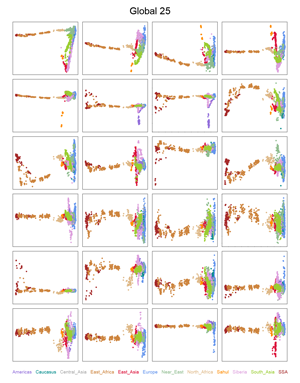 Hence, Plinkaigalis242 and Gyvakarai1 only form a clade with Yamnaya to the limit of the resolution in the analysis by Mittnik et al., but aren't exactly identical to Yamnaya. The relevant datasheet is available here. So what might this mean? Possibly that the ancestors of this Corded Ware trio "absorbed" trace forager and/or farmer admixture as they migrated from the Pontic-Caspian steppe to the East Baltic. Or it could mean that they came from a more westerly part of the Pontic-Caspian steppe where people harbored slightly elevated forager and/or farmer ancestry relative to Yamnaya. More sampling of Eneolithic and Early Bronze Age (EBA) burial sites on the Pontic-Caspian steppe, particularly north of the Black Sea, will probably solve this mystery. 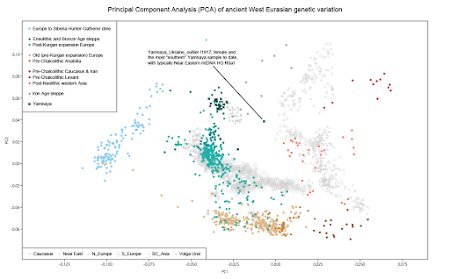 Please note, however, that we already have an Eneolithic sample from the Pontic-Caspian steppe that not only packs extra farmer admixture over Yamnaya, but also belongs to Y-haplogroup R1a-M417, which is a marker intimately associated with the Corded Ware expansion (see here). By the way, this is how the Corded Ware set from Mittnik et al. 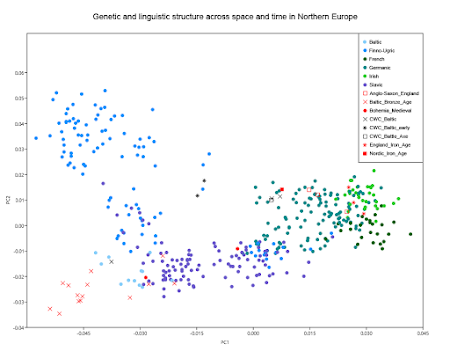 behaves in another of my PCA, which is designed to focus on entho-linguistic-specific genetic drift in Northern Europe. I don't usually run samples older than the Bronze Age in this analysis, the reason being that they often don't share enough genetic drift with modern-day Europeans to produce meaningful output. And to be honest, I'm not quite sure what to make of these results. But it's probably not a coincidence that the Scandinavian Corded Ware (CWC_Battle_Axe) individual clusters so strongly with the Nordic Iron Age and modern-day Scandinavian samples. The relevant datasheet is here.